Thanks to My Blog Spark, I was recently given the opportunity to try new Honey Kix Cereal and share a Honey Kix Prize pack with one of my readers. 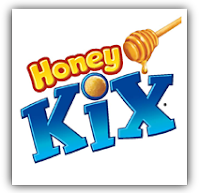 Honey Kix has all the goodness of Kix with the Great Taste of Honey! Honey Kix has 16 grams of whole grain to keep the kids (and you!) going in the morning and 3 g of fiber. Honey Kix also has no artificial flavors or preservatives. I received my package from MyBlogSpark last week and had my husband pick up a box of the new Honey Kix when he was running errands. I was excited to try the new Honey Kix. Kix is one of those cereals that I have always enjoyed eating - I always find that they have a light, natural sweetness - and I thought that the honey would add an interesting flavor and sweetness to the classic cereal. Saturday morning, the kids and I each had a bowl of Honey Kix for breakfast. I was pleased with the cereal. To me, the flavor of the honey is more noticeable when eating the cereal in milk than it is eating it dry. They taste very similar to regular Kix but are a bit sweeter. I definitely like that they are only 120 calories per serving with only 6g of sugar. Makes me feel good about serving it to my kids and not guilty about eating it myself. The kids asked for more, so I would say that they enjoy the cereal. In fact, it was the cereal of choice on Sunday morning for both. To help with the launch of this new product, MyBlogSpark has generously offered a Honey Kix prize pack to giveaway to one of my readers. The Honey Kix prize pack includes a coupon for a free box of cereal, a honey jar, a cereal bowl, a handy container to take your cereal and milk on-the-go, and a large container with pour spout to keep and serve cereal at home. How can you enter? For the first entry, leave me a comment about your morning routine and how new Honey Kix would fit in it. Blog about this giveaway and leave a comment with a link to your post. Subscribe to my blog via email or RSS and leave me a comment letting me know you subscribe. Grab my button (on right sidebar) for your blog and leave me a comment with a link to your blog. Follow me on Twitter and Tweet about this giveaway using @ABusyMomofTwo. Leave a comment with a link to the Tweet. This contest will remain open until July 27th at 7 pm. I will use a random number generator to select the winner. I will contact the winner by e-mail and they will have 36 hours to respond with their contact information or a new winner will be drawn. Our morning routine is pretty standard. I do get out their clothes the night before and pack lunch so that I do not have to in the morning. This would make a great breakfast on the go. The "to go" items would be great. Ideal for riding in the car on my way to class. Thanks for the chance to win! 3. Go jogging or on a bike ride. 4. Eat. I could possibly be eating Kix. :D Fits in perfectly. Sometimes 3 & 4 are reversed, depending on how hungry I am. I try to keep my breakfast under 200 calories, so a serving of Honey Kix + 1/4 cup light vanilla soymilk (a favorite of mine that adds a touch of extra flavor to any cereal) sounds just about right. We are in transition and moving to a homeschool schedule, so we are pretty much breakfast, get ready for the day, quiet time with Jesus in any possible order. Having variety to the ceral I serve would be great as they getting burnt out on the deals I find! I have a 2 year old, and a 3 year old, so our morning routine is pretty easy. We eat breakfast, usually cereal, then we change diapers and get dressed. Pretty simple! Our morning routine usually consists of sleep deprived mommy dragging into the kitchen to get the kids some cereal and o.j. I'd like to see what the kids think of Honey Kix. We get showers, eat breakfast(Honey Kix) would fit in here, then off to work or school. My son has loved Kix since he was little!! Wake up, run, shower, dress, hop on the metro, eat breakfast at work. Eat breakfast I usually perfer cereal. One of my cuties likes to sleep in while the other is up early. The early riser has some chocolate milk, and we read and when my sleeper wakes up we eat breakfast, then I exercise and we dress for the day. Our morning routine. Wake up, wake kids up, get them dressed, get breakfast ready (usually milk and cereal). Kix is gonna be a great addition to their menu! Our morning routine is simple cup of juice toast and a bowl of cereal. our morning routine is get up, get dressed, eat cold cereal...Honey Kix would be a treat...and get the chores started. :-) thanks! We pretty much have no routine! Kids are homeschooled, and I work at home, so we all kind of just do our thing and eat when we are hungry. Kik Honey would be great as it is something any of us could grad and eat anytime we feel like it! Mornings are busy, I get up first, then husband, then kids, fix breakfast is sometimes all different for all of us. This would be great to win. I like the cereal holder idea. Thanks for your blog. Honey Kix would fit into my morning routine perfectly. I always eat breakfast and I could stir Honey Kix into my yogurt or just eat them in a bowl with milk. Yummy either way! I am a new e-mail subscriber. my morning routine consists of getting up for work and making sure that lunch and backpack for summer day camp are packed and ready to go for my daughter... after that, a nice relaxing shower and some breakfast for hubby, me and my daughter (my teen son sleeps in haha) hubby heads to bed as he works nights, and I head off to drop my daughter at the day camp center and go to work afterwards. Kind of a rushed day, and the Honey Kix would be a great start to the day! Right now my morning routine is much more relaxed!! We get up, eat, then play 'candies for capitals'. Mom does some work, the kids play, then outside until lunch. Honey Kix would be loved for a snack by my 18 mo. old. Our mg routine is casual. My kids get up at different times-get their own breakfast :) I think the cereal and milk to go items are ideal if someone is running late for work etc. Love the to go containers! That'd be great rushing out the door in the morning! Zach starts kindergarten next month, so this would probably help get him a good start to his mornings.